Smart City innovations offer mayors across the world a promising new way of engaging citizens and increasing quality of life. To offer city leaders guidance on assessing the readiness of their governments to develop, facilitate, or track their smart city initiatives, Eden Strategy Institute and ONG&ONG (OXD) developed this independent ranking of the Top 50 Smart City Governments, selected from over 140 cities globally. Why the need to rank Smart City Governments? Discover the methodologies used in this ranking. In the course of our study, we have identified 10 Themed Observations for governments to consider when planning a Smart City. Read our full report that details these insights, by clicking the button at the top of this page. Innovative smart city funding mechanisms include competitions and hackathons, partnerships with private companies, smart procurement policies, and national- or state-level funds. Defining the smart solutions relevant to a city involves studying the actual interactions that citizens have with the city, leveraging the city's natural strengths, and co-creating the smart city vision and roadmap to align all constituents . Cities around the world are increasingly experimenting with geographically-concentrated innovation ecosystems as innovation testbeds and hubs for knowledge exchange. A city only becomes truly "smart" when all citizens are ready for it. 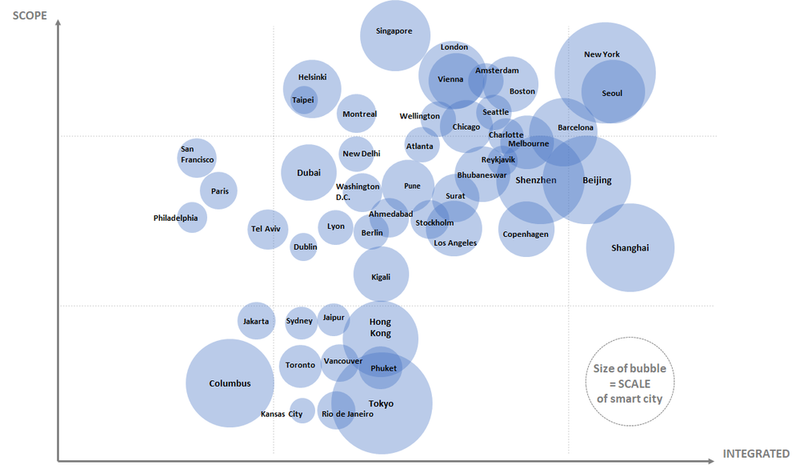 Cities risk excluding entire segments of their population from the smart city experience. Teaching people how to navigate the digital world is a critical aspect of a digital inclusion plan. Open data has emerged as a cost-efficient way to increase civic engagement, introduce city projects that attend to citizen needs, track the performance of smart city initiatives, improve efficiency and responsiveness, and apply knowledge from the general public to city solutions. Involving outside businesses, startups, students, and the public at large can lead to larger variety, volume, and quality of insights, ideas, and feedback. In turn, citizens have shown great enthusiasm when they are given the opportunity to participate in designing and deciding their cities' future. Governments need to design flexible pathways for leadership to naturally evolve, as smart city initiatives increase in complexity or range, as the focus of initiatives broaden, or as the numbers of constituents grow in the city. City leaders can gain access to extensive knowledge networks and do not have to accomplish their smart city mission in isolation. Leading smart cities recognize the importance of supporting their citizens of all ages with digital skills. Learning experiences include hackathons to help communities familiarize themselves with digital tools, formal educational programmes, and industry immersion to help create the workforce of the future. A truly smart city has the potential to transform the character and liveablity of a city, rejuvenate its economy and heritage, enhance its resilience and sustainability, and even tighten the social compact with the government and among citizens.